It’s Remembrance Day, which means bye bye, poppies! I’m glad that I could contribute to the local colour by knitting a few, but it’s nice to have it done, and to be back to my ‘normal’ knitting. 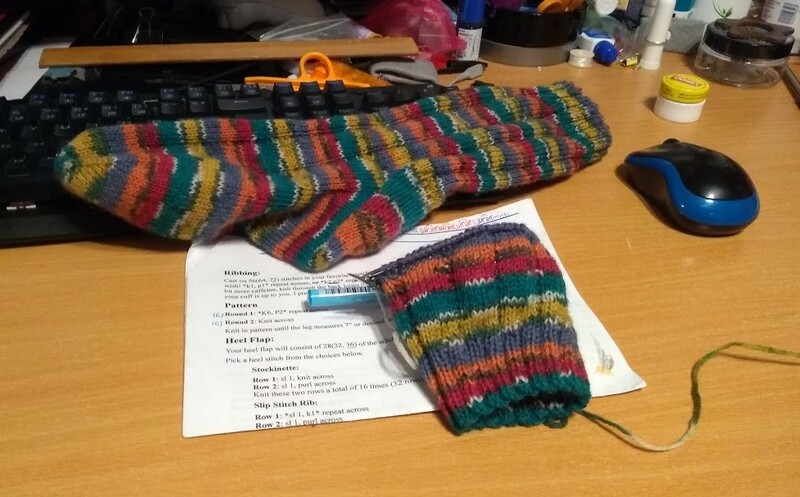 I’ve got the second sock and another thing on the go, so it’s a matter of whether or not I work them at the same time or not. I’m not too fussed either way, as the former is for me, and the latter isn’t anything that needs to be completed with any immediacy. I’m having to swot my brain’s desire to play with beads down. I want to make/play with making some super-fiddly things with tiny beads, but I think I would do my head in at the same time. A part of the ‘problem’ is that I kind of want to do multi-stranded things, but I don’t have the right findings to hand. I have some things I want to experiment with to see if I can make them work without buying things, but. Mainly, I need to keep not buying things until other things sell. Right, time to eat dinner, so I’m off.